The Race for Life, as many will be aware is an event dedicated to raising awareness and funding for research into curing cancer and to aid people suffering from the illness. Since Race for Life started in 1994, an incredible six million participants have raised over £493million, more than any other UK event series raising money to fund cancer research. It is such a good cause and to be a part of it was amazing. The day of the race, a sunny mid June Sunday, hundreds of women and girls congregated in Trent Park, Enfield, for the annual race for life. Among the crowds, a group of girls from the Chingford Foundation School Sixth form, organised by Miss Harrison and Miss Shadbolt. A mixture of walkers, joggers and runners were in the group, some had participated in the race for life before, but for the rest of the girls, it was their first time doing the event. When the race started, the crowds of runners seemed to merge into a blur of pink, with several runners wearing tutus and feather boas to show their spirit and have a laugh with their friends, looking silly for a good cause. The sixth form girls were a part of this, with several wearing fairy wings and their race for life t-shirts, all with an aspect of pink in their running gear, including Miss Harrison’s Chihuahua, which was also dressed accordingly. Although 5k does not necessarily sound that far, when you are running on a hot summers day it is harder than you would think- especially if you are new to running. The support of helpers around the course is really motivating, all of them shouting encouraging words. When you see the finish line it is an awesome feeling and the final sprint to the finish (even if you’re tired), is something that you remember, you get a feeling of achievement and a big grin on your face. As you went through the finish line, there was cheering and support from the spectators, and you received a medal for your participation. By competing in the event, the sixth form girls who took part in the event have raised a total of £615 donation money so far which will go to Cancer Research UK. 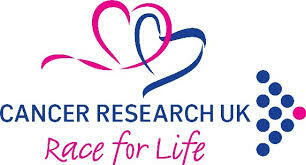 If you would like to donate, please go to http://www.raceforlifesponsorme.org/cfs-girls.